Regime's show trial is political - only serves to undermine its legitimacy further & expose the truth about 2010's violence. December 12, 2013 (Tony Cartalucci) - Unlike Thailand's defacto dictator, Thaksin Shinawatra, who has fled a two-year prison sentence and is currently running the country from abroad, evading 2 warrants and a long list of pending court cases - former PM Abhisit Vejjajiva has elected to stay in Thailand and stand trial in an overtly politically motivated court case. Image: Former PM Abhisit Vejjajiva has, unlike his rival Thaksin Shinawatra, elected to stand trial, confident that he will win against what are clearly politically motivated charges. The violence he is accused of is documented to be the work of militants admittedly working on behalf of pro-Thaksin mob leaders. 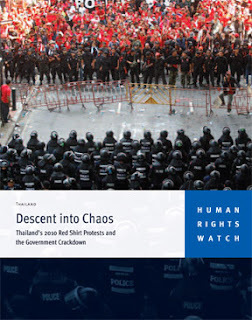 Under Abhisit's government, more than 90 people died and nearly 1,900 were wounded in street clashes in 2010 between mostly unarmed pro-Thaksin "Red Shirt" demonstrators and security forces firing live rounds. The Democrat Party leader arrived at court without speaking to waiting media. Thailand has seen several bouts of political turmoil since Thaksin was ousted in a military coup in 2006, with rival protests spilling into the streets in sometimes bloody unrest. Prosecutors have accused Abhisit and his former deputy Suthep Thaugsuban of causing security forces to carry out murder and attempted murder. Oxford-educated Abhisit -- who was formally charged in December -- insists he is innocent and has described the accusations against him as politically motivated. It is important to note the phrase "mostly unarmed," the Western media's way of admitting government forces were fighting armed militants but still making it appear that the government simply machine-gunned dead 90+ innocent people. Of course, just like when the Western media used this rhetorical smoke and mirrors in Syria, Libya, and Egypt, there was certainly more to the story. He told the BBC that government forces had "very little option" but to act when live fire was used against them. "We tried to negotiate with the protesters, and they wouldn't accept any of the deals that we offered them," he said. "Unfortunately we were facing a situation where they occupied the middle of the city... It was our duty to restore order, and that's what we were trying to do." 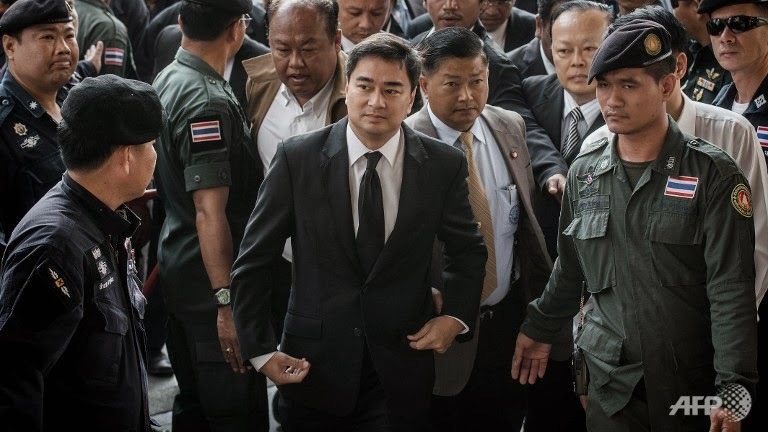 Mr Abhisit said he would fight to prove he was not guilty but added: "If, for whatever reason, the courts pass a guilty verdict, I will accept them. That's the way that things should be done." The "red-shirt" protesters, many of whom supported ousted leader Thaksin Shinawatra, occupied Bangkok's financial district in March 2010. Violence flared in April when police tried to clear them from the area - after which they moved to the city's commercial heart. They remained there until 19 May when armed government troops moved into the red-shirt camp, smashing through barricades. More than 90 people were killed over the course of the protest. These claims aren't merely fabrications of a government trying to defend what the BBC attempts to make out as heavy-handed brutality. Human Rights Watch, based on video and photographic evidence, would describe in detail the violence the BBC only alludes to in April, revealing that first blood was drawn by heavily armed militants with professional bearing attacking government troops. Clearly, the protesters, portrayed by the Western media as only being armed with crude sling shots and rocks were cover for a much more insidious force, heavily armed with military-grade weapons who in fact, drew first blood on April 10, 2010, killing 7 soldiers and dozens of bystanders in the deadly crossfire that ensued. Evidence also suggests that opposition snipers purposefully targeted their own protesters to escalate the conflict further. Image: Thaksin Shinawatra's militants can be seen here clearly deploying both AK-47s and an M16 with an M203 grenade launcher attached below the hand guards. Clearly, those killed and wounded by the M16's 5.56mm rounds weren't solely the victims of military gunfire. Image: A freeze frame of the above footage showing clearly the front sight posts of an M16A2. It is important to understand that these militants were armed with M16s, because many of the charges Thaksin's party has leveled against his enemies hinge on the assumption that only the Army possessed weapons firing this particular caliber. The suspected leader of these militants, renegade general Khattiya Sawasdipol, known as "Seh Daeng," further corroborated that the opposition was in fact armed by admitting to commanding 300 armed men trained for ''close encounters'' and carrying M79 grenade launchers, before withdrawing his comment in later interviews. From April 10, until the widespread arson that marked the end of the protests on May 19, daily and nightly gun battles, grenade attacks, and sniper fire would claim the lives of 90+ people. This included 9 soldiers and police, a woman killed by an M79 grenade attack originating from militant positions, and at least two protesters who died of smoke inhalation while looting a building fellow protesters lit ablaze. The remaining deaths included journalists, bystanders, medical workers, and protesters caught in crossfire between soldiers and heavily armed militants. While Thaksin's political machine and complicit Western media outlets such as the AFP to this day attempt to portray these events as a massacre of "90+ protesters," it is quite clear that the military was up against an armed wing working amongst the protesters, admitted by members of the protest leadership themselves. [DSI Chief] Mr Tarit said the meeting decided to lay charges against Mr Abhisit and Mr Suthep under Sections 59, 83, 84 and 288 of the Criminal Code, based on a Criminal Court ruling on the death of a taxi driver during the 2010 political unrest. Mr Abhisit and Mr Suthep will be called in on Wednesday to acknowledge the charges. The court ruled on Sept 17 that the taxi driver, 44-year-old Phan Khamkong from Yasothon province, was killed by security forces near the Ratchaprarop Airport Link station on the night of May 14, 2010. Soldiers opened fire to stop a suspicious van that drove into a security area while Phan was walking nearby. The court said Phan was killed by a high-velocity bullet used in war weapons. Mr Abhisit was prime minister and Mr Suthep was deputy prime minister and director of the Centre for the Resolution of the Emergency Situation (CRES) in charge of the red-shirt protest crackdown at the time. This is the same DSI who admitted to knowing about Rohingya slave camps being operated in Thai territory, but elected to not investigate or intervene. Unfortunately for Thaksin's current proxy government and their politically motivated show trial, "high-velocity bullets" were used by both sides throughout the duration of the conflict. Specifically, NATO 5.56mm rounds, fired from M-16s were explicitly observed being employed by Thaksin's militants. 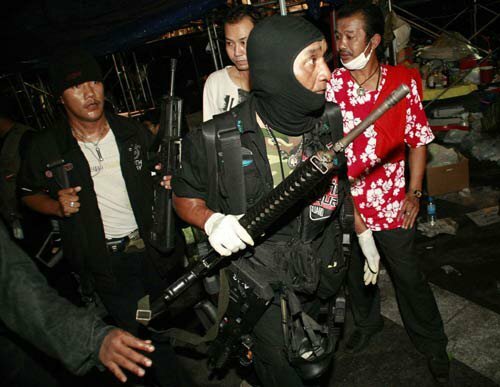 Additionally, a large number of military weapons were seized on April 10, 2010 by Thaksin's "red shirts" after the Army fled during the initial armed ambush. 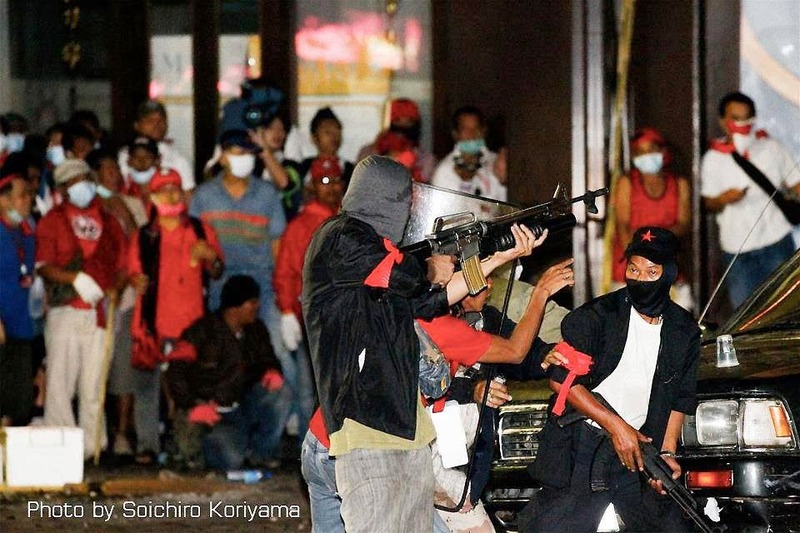 Image: Not only did Thaksin's militants bring their own M16s to the firefight, they also at one point during the night, veritably seized a large amount of weapons from Thai soldiers who fled in disarray after the ambush organized by elements within the Red Shirt's leadership. Unless the court was able to trace the bullets that killed Phan Khamkong to a military issued rifle, and place that rifle in the hands of a solider at the time it was allegedly fired, his death, like many others (and here) Thaksin and his political machine have attempted to leverage politically, could just as likely have been the work of his own militants. The streets of Bangkok Thailand in the spring of 2010, didn't constitute a "crime scene" - they were a battlefield. The BBC's failure to inform its readers of these facts and the overt political motivations behind this current trial indicates that Thaksin Shinawatra is still drawing on significant Western backing - that will continue to manifest itself as support for his proxy government, led by his own sister, and their current bid to extort concessions from their political rivals. Former-PM Abhisit and former-Deputy PM Suthep are not expected to be found guilty in what is widely recognized across Thailand as a show trial designed to pressure the Thai establishment to grant Thaksin a pardon for his 2 year jail sentence and absolve two warrants out for his arrest. Thaksin is currently living in self-imposed exile to evade his convictions, warrants, and jail sentence. He also faces a myriad of pending cases and may still face retribution for a so-called "War on Drugs" he waged while prime minister, that saw nearly 3,000 killed in 90 days, extra-judicially in the streets, most of whom had no involvement in the drug trade - and the following year the massacre of 85 protesters in a single day (Tak Bai).